RCP Marketing is currently celebrating 35 years of business. We’re proud to have lived through an entire generation of social, economic, and technological change. Take a look at some of the things that have changed in our industry since 1981! Advertising, as a whole, has changed it’s perception from straight forward and product driven to creative stories filled with imagination. 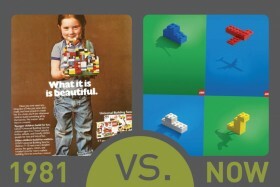 In this ad 35 years ago, we needed a narrative explaining what Legos are. Today, we envision what people like to do with Legos by telling adventurous stories and watching animated movies about them, we also now build Legos using computers. In 1981, 5 inch floppy disks, punch cards, and the Calbot programming language were primary products. Today, technology has moved far beyond huge chunks of molded plastic and green screens. The computers that would fill desks and rooms are now replaced with smaller versions that fit into our pockets and contain more processing power and connectivity than all of the computers in 1981. Starting its life as something called ARPANET, the world wide web helped universities and the military communicate through modems over telephone lines in the early 1980s. Now, with trillions of locations to connect to, the world wide web remains as one of the greatest inventions of the last 35 years. Unbelievably, people have been making mobile phone calls since the 1930s via an operator and switch. However, Nordic Mobile Telephone Systems took 40 years of basic mobile calling and released the first DynaTAC 8000X portable mobile car phone in 1981 – it connected directly to a telephone grid without having to dial an operator. Today, our phones, computers, tablets, printers, etc. are considered mobile or wireless and are connected to not only cellular telephone networks, but to the internet as well.